NASA may still frown upon knocking back a cold one during spaceflight, but Australians can now sample the world’s first beer designed for consumption by high-flying space tourists. The Australian brew, called Vostok “4 Pines Stout” Space Beer, contains both high flavor and low carbonation. Its rich chocolate and caramel flavor aims to remedy a supposed reduction in the sense of taste due to swelling of the tongue in space. Low carbonation means fewer problems with so-called “wet burps” experienced by astronauts or other space travelers. “If you burp in space, it’s usually wet because the liquid and gas doesn’t separate in your stomach like they do on Earth,” said Charles Bourland, a consultant for the NASA Food Technology Commercial Space Center. Whether taste gets affected in space remains an open question, Bourland told InnovationNewsDaily. Astronauts have reported mixed experiences, and NASA never put together enough study data to definitively find changes in taste. The space beer came out of a cooperative effort between the 4 Pines Brewing Co. and space engineers at Saber Astronautics Australia. They hope to target the wealthy crowd of future space tourists flying with private suborbital spaceflight operators such as Virgin Galactic. 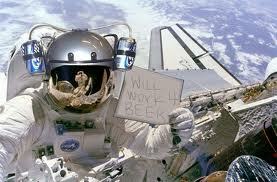 Luckily, no one needs to shell out for a space tourism ticket and a chance to taste the Vostok Space Beer. Any thirsty space fan can enjoy the beverage in full Earth gravity by simply visiting Australian food retailers or select local pubs.